Software designed specifically for medical device professionals could provide an efficient alternative to clunky paper-based and computerized quality management systems. More than half of medical device companies still use paper-based quality systems, according to Jon Speer, cofounder and VP of QA/RA of a startup named greenlight.guru (Indianapolis, IN). And such paper-based systems are often fiendishly hard to use, inefficient, and inaccurate. Many are reminiscent of public libraries with paper card catalogs and a disorganized collection of books on the shelves. A paper-based system, for instance, might specify that a given file is in a file folder with a random-seeming alphanumeric name. After opening the file, a user may find that the document in question is missing. Or that a document that is supposed to have a signature on it lacks one. 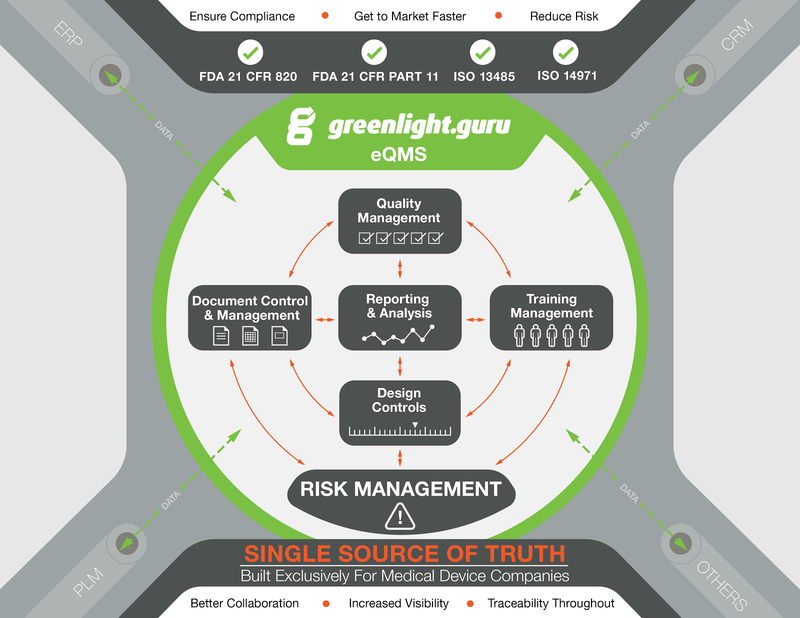 A traceability matrix from greenlight.guru's software. In the age of Google, such headaches are inexcusable. But while several computer-based quality systems are available that, are theoretically more efficient than their paper-based alternatives, they are generally clunky and hard to use. General PLM or QMS systems weren't designed for medtech applications in mind, and as such, must be customized. They tend to rely on a scattershot collection of documents stored in arcanely named digital file folders. Engineers using such systems often must rely on emails and phone calls for quality-related information. "A lot of software solutions that I've seen in use are really like virtual versions of paper-based solutions," Speer says. "They have a lot of file folders that aren't much easier to manage than the file cabinet in the hallway with all of the manila folders." Greenlight.guru (Indianapolis, IN) was founded to help streamline the process. Inspired by consumer technology platforms from tech behemoths like Google and Apple, the company has developed a user-friendly cloud-based SaaS quality management system for medtech companies. The company's software is designed to provide medical device professionals using paper-based quality system that serves as a central hub for quality system management. Like Apple products, the system was designed to be easy enough to use that no user manual would be required. The company worked to accomplish this objective by constantly getting user feedback. "From the beginning, it was our goal to get med device companies using the software as we were developing it," Speer says. When functional early versions of the software were ready, it was shared with medical device professionals. "We watched where they clicked and what they did. Rather than force someone into a certain way of doing something, we observed them and structured the software based on that.We have gotten some fantastic ideas for new features from our customers and from listening to what their demands are," he adds. Founded in late 2013, the company recently announced the public release of its software after releasing an alpha version to a small user group in March of last year. A beta version followed in November 2014. A product overview schematic for greenlight.guru's software. Earlier this year, the company closed a $1.25-million seed round, which it will use to beef up its engineering staff and to drive future product development efforts. The company has something of a unique team. Speer has 16 years of experience in the medical device industry while the company's CEO, David DeRam, has 23 years of software industry experience. Its COO, Jason McKibbin, has 10 years of experience as the COO of MEDISISS, which was eventually acquired by Medline. The company's development is comprised of both veteran coders as well as Millennials looking to push the cutting edge in terms of how software is developed. Refresh your medical device industry knowledge at BIOMEDevice Boston, May 6-7, 2015. Brian Buntz is the editor-in-chief of MPMN and Qmed. Follow him on Twitter at @brian_buntz.